Remember, our media Is designed to create fear In the hearts of as many people as possible! Truth is elusive unless you’re at peace within our own heart. Our reality begins in our thoughts and are created by thought. Mass consciousness is the goal of those who control the media in order to deceive us into creating New World Order or Police State with our collective thoughts. Would you rather have a world that is free of corruption and CORPORATE GOVERNENT control? A world free of the controllers and continuous wars for control of the One People behind imaginary borders. One World, One Heart, One People! It begins with you! Change your thoughts, change your reality. What world do you desire? The choice is yours. It is my duty to inform the common public to fathom how the United States will be transitioned to a New Republic. Once the arrests of all politicians who are members of the United States Corporation have been completed. Understand that the entire country will be left without leadership. This will cause chaos among it’s citizens especially to those who are unaware. Politicians down the chain of command to city mayors will be arrested. All politicians who will not accept transition will be arrested. Then with thousands of political offices empty, these offices will have to be filled by qualified individuals of the New Republic. The New Republic will have to assume control of 50 States and 350 million people. I am to inform you that this will not be a smooth transition. This is what Jade Helm is for, folks. Currently at this moment, the Pentagon is sided with the New Republic. The Pentagon controls the United States Military. Jade Helm is the preparation of this transition. Politicians will be arrested left and right and citizens will be in panic. The U.S. Military is required in order for this transition to be successful, without the military it is impossible. The U.S. Military will send out a message through the Emergency Broadcast System (EBS) prior to the operation commencing in order to prepare the masses for the transition. There will be chaos, there will be panic. This transition may last for weeks or even months. I urge you to prepare for this upcoming transition as it is going to be a Revolution. In other news: Is there a message being sent to the Cabal? Recently, Beau Biden, son of the Vice President of the United States passed away. John Kerry, strangely had an accident and was injured around the same time of Beau Biden’s death. Slowly you will be witnessing news like this more and more as the Cabal and their system slowly crumble to the ground. Do not be fooled by mainstream media as I’ve reported that intermittent arrests of the Cabal has started weeks ago. Their time is at an end. The Liberation of Soul has already begun. Worth the time required to really listen! Confirmation of previous heard techniques for meditation, mind control and more. Very well done and a big THANK YOU to Dark Journalist for the Q&A approach used for this interview. Join Dark Journalist and his special guest Physicist, Author and veteran of Special Covert Black Projects, Dr. Richard Alan Miller! Together Dark Journalist and Dr, Miller will discuss upcoming worldwide events such as Earth Changes, Pole Shift, Economic Upheaval, Corporate SuperState, new research in Nanotechnology and Monsanto’s development of GMO Mind Control! In his career working in Naval Intelligence training Navy Seals advanced mental and higher consciousness tools, Dr, Miller has developed a unique understanding of Psychic Experience, Mind Control, Dream Telepathy and Metaphysical Research. Referred to as ‘Spooky Miller’ by his peers, he was the original inspiration for the X-Files character, ‘Fox Mulder’ and his boss, the mysterious Dr. Carl Schleicher, was the CIA spook from which they derived the ‘smoking man’ character. Now retired from his special work in the secret underworld of covert intelligence projects, Dr. Miller will share his knowledge of Holographic Consciousness, DMT Spirit Molecule, Remote Viewing, Alien Abduction, Geo-engineering, Planet X, Altered States, ESP, Astral Projection, Time Travel, SuperSoldier Training and the Secret Space Program! One of the most fascinating, revealing, stunning, and wide-ranging episodes of Dark Journalist, you won’t see this in a TED Talk! Updated: April 4th 2015: Synchronistically, on the same day this article was published, a NOTICE and PUBLIC ORDER was issued by Judge Anna Von Reitz. 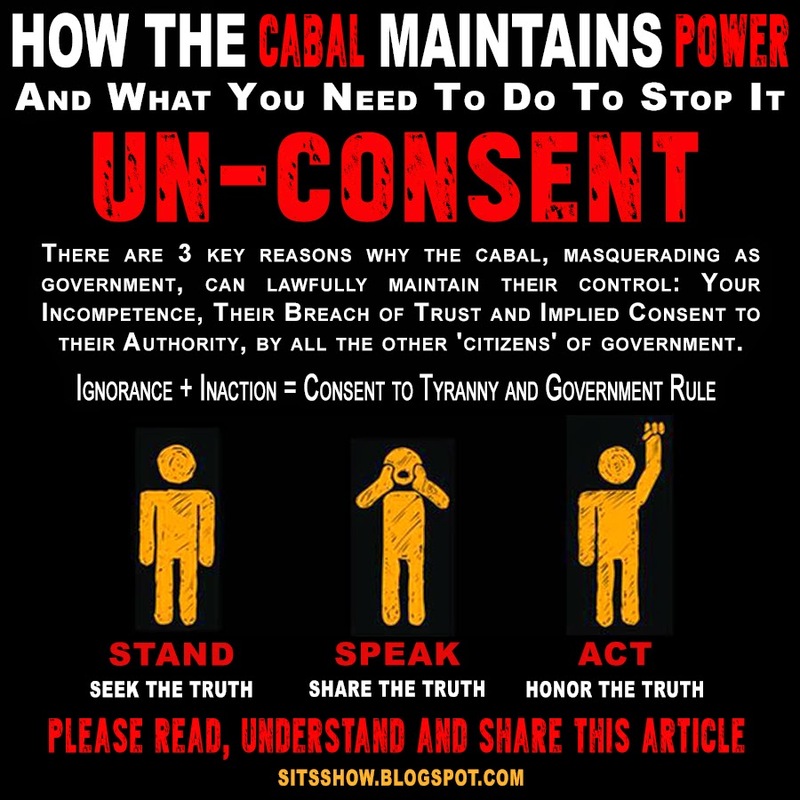 The notice can be used to help bring awareness and take action to end the mandate of authority maintained by the cabal, one more tool in our chest for freedom. The article below is a history of how the Vatican led, Federal Reserve System took over the world, stole the constitutional republic from the people, and installed a corporate slavery system, debt slavery, without anyone taking notice. This is ESSENTIAL data for anyone aspiring to be free. True freedom, personal sovereignty, the freedom described by the founding fathers, can only exist with profound knowledge and willingness to defend that freedom, from those who would take it. Before that article, I am going to describe all of the underlying core principles in simple everyday language. There are 3 key reasons why the cabal masquerading as government can lawfully maintain their control: Your Incompetence, Their Breach of Trust and Implied Consent to their Authority, by all the other ‘citizens’ of government. The people’s relationship to government the world over is greatly misunderstood. Most people think we are the servants of government, that they are at the top and we are at the bottom. But Government is now, and has always been, a Trust Relationship, with the people over the government. Trust Relationships are managed under Equity Law, the Law of the Sea, otherwise known as Contract Law or Common Law loosely.While there have been many claiming these laws are ‘bogus’ and irrelevant, this is not taking into consideration the whole truth, which I will attempt to briefly explain. The basis to our legal/lawful system is Natural Law, and free will consent. So long as consent is given, it is in accord with Natural Law, the ‘rules that are made’ once consent is given (legal codes and statutes) is where most of the erroneousness is contained. Natural Law is consent, man’s laws are the rules created, once consent is given, or implied. Law of Free Will: A trust agreement, or contract seems like some invention of modern society, but it is actually a principle of the natural world and has always existed. When two or more free will beings want to interact, they do so using agreements, and if we analyze life itself, we can see that at every level of interaction, there is always consent operating. Free will, in this sense, is ALWAYS honored, but since someone may not understand what they are consenting to (due to lack of knowledge), they may agree to something in the past, which is later discovered to be dishonorable.. The point is, all power and authority is actually an agreement between the people to be governed. Hence all governments, whether a Monarchy, Democracy or Republic is a trust agreement, an Corporation (Corporeal Oration – to make real through speaking, agreement). This aspect of reality is understood deeply by our would-be masters, and they know that any power one person has over another is illusory. Someone can claim to be your master, but usually needs to use coercion, threats of violence, in order to compel your consent; fines, imprisonment, sanctions etc. This is a crucial point to understand, and while many people would like to believe we are totally victimized by the cabal, the truth is, our own incompetence and lack of action, gives them our consent. More on this later. Lastly, the creator of the universe needs to be taken into consideration. For some this may seem like woo woo, but our would-be masters acknowledge the existence of a creator (albeit a distorted and fallacious concept of one), and in all honesty, so must we if we want to understand our true place as creditors and grantors of the estate; our freedom of mind, body and soul. These essential ideas must be accepted (at least on the surface) in order for us to understand how the systems on earth work. The narrative can be summed up as follows: The Creator is within each being in the universe, from small to large, and when free will acts, it is literally an aspect of the creator in operation. The powers that should not be know this deeply, and this can be seen by reviewing the Papal bulls of the Vatican. When the creator ‘sent us forth into the creation to move, breathe and have our being’ we agreed to do the ‘working of god’ and honor ‘his will.’ We were entrusted with a mind, body and soul to do this, creating our ‘temple within’ and help create a harmonious paradise on earth. The powers that be know this, and have described it within their own writings. The covenants of God, within most abrahamic religions, are an example of this. Papal Bulls assert the Vatican and it’s trustees as the trusted consorts to god, stating until God or the people do otherwise, their rule is divinely ordained; until we dispel their presumption of god given authority. They say: until we ‘come of age’ and realize our purpose, those who have ‘come of age’ are entrusted to share their knowledge and educate us so we can do the great work. If we refuse to do the work, and fall into sin (ignorance of our original trust with god to do his will) a trusted consort to god must come in and manage us till we see the light; the Vatican and it’s agents in this case. Because each person is a powerful embodiment of the creator, if we use our powers unwisely, we can create much chaos in the world. Until we come of age, and begin using our will to create harmony we must be managed like animals and spiritually dead things. While this is a sobering perspective to contemplate, it is in harmony with Natural Law, but the Vatican fails to do what god commands them to do (educate and uplift humanity) and this is a crucial point we will address later. We need only look out into the world to see how this narrative reflects reality. Our world is being destroyed by war, environmental pollution and manipulation via deception of the people. Our world is run like a pirate planet. Where things go horribly wrong is that our ‘consorts to god’ our would-be masters, are in Breach of Trust with god. They are morally obligated to share the truth and uplift us so we can become competent. More on this later. Trust Agreements (contracts) are very simple. When you want to ensure something you own or manage is taken care of, while you are away – an estate, you can create an agreement (trust) with a friend who can manage it for you. You set the rules for managment that your friend must follow in order for them to honor your agreement. This presumes: your competence to manage the estate, that you own the estate and that the person you entrust to it will relinquish it back to you upon your return. The person you entrust with your estate is the trustee, you are the grantor, and in this case, the administrator because you set the rules for how the trust is to be managed. Finally, you are also the beneficiary, because you benefit from your estate being managed while you’re away. This is the standard form trusts take the world over under many names, with three roles: Grantor/Administrator, Trustee and Beneficiary. Your Incompetence: If you die, are lost at sea, or ‘go crazy’ (becoming incompetent), the trustee can claim as such, and gain complete control over your estate. Unless you present yourself, so as to dispel the presumption of your death or incompetence, the trustee stays in control. Their claim of incompetence or death becomes a cured fact in Equity Law. The key concept being, ACTION MUST BE TAKEN BY YOU, in order to dispel the presumption, and regain control over the entrusted estate; in this case government. You must be present, which indicates you have come of age, and are able to use the estate entrusted to you by god; your body, mind and soul – and what you do with these things. Breach of Trust: If the trustee does not honor the rules you set up, they are in BREACH OF TRUST. In order to reclaim the trust, you must notify them of their failure to honor the trust agreement (filing a UCC1 Financing Statement is one method). If you fail to do this, you are negligent, and by definition incompetent. Clearly, if you can not recognize that the person you entrusted to managed your estate is breaking your rules, then you must not be competent. As a result, the trustee can maintain control, even if you are alive and not lost at sea. Implied Consent of all the other ‘citizens’ of government: This is the crucial point most people miss. The government is the trustee of the people, they have to do what the people say, or more accurately, if they CLAIM that the people want something, and the people do not say otherwise, now the government has a MANDATE issued by the people, as a result of their silence by consent. In other words, if the government claims that the people want to be enslaved, and the people do not say otherwise, they agree by their inaction. This is known as implied or tacit consent. The cabal controlled government, the trustee, declared all of it’s citizens as incompetent, and enemies of the state (“Trading With The Enemy Act” (Sixty‐Fifth Congress, Sess. I, Chs. 105, 106, October 6, 1917), and as codified at 12 U.S.C.A. 95a.). This claim, under Equity Law, became a cured fact when NO ONE TOOK ACTION to notify the trustee’s of their Breach of Trust. As a result, the government now has a mandate, procured from the people themselves, to manage the people as incompetent slaves. Literally, we gave them permission to do everything that has been happening on earth. Granted we were unaware due to pervasive deception on the part of the trustee’s, but our inability to see the fraud, proves their case of our incompetence. The solution to this is simple, yet long of action. Before we can solve the problem, we must gain knowledge of what it is, how the trust relationship was set up, and where things went wrong. When you were born, your parents declared you incompetent, and created an estate with the corporate government to manage your affairs for you, until you come of age; become competent. This declaration is accurate. Until you understand how the world works, what Equity Law is, and what your true status as a Grantor and Administrator are, you are not competent. Given most people have no idea about any of this, their claim is accurate in the aggregate. If the government was honorable, it would disclose all of this to you during the course of your life and eventually you would take control of your estate. But the trustees are not honorable, and instead they do everything they can to keep you ignorant, offering all sorts of distractions to maintain your status of incompetency. By the time you do come of age, you’re more interested in distractions then you are in managing your estate (mind, body and soul), and taking responsibility for your life. We will be discussing these treaties in more detail in a moment and how they go to the motive of the equally bizarre and false 13th amendment that converts every United States of America citizen into both a criminal and a slave, or a 14th Amendment US citizen into a piece of cargo- being worse than a slave. The 13th Amendment does not abolish slavery; it converts it into a claimed religious and moral right. The 13th Amendment does not end slavery; it just changes the name of slaves to criminals. So if I am able to claim someone as a criminal, such as in summary justice – then I can make them a slave. How could anyone in their right mind logically conclude then that the 13th Amendment abolished slavery? It did not! – it institutionalized it to the present day under the Fascist models of the NWO 2.0 then the Third Reich and now the Fourth Reich. Lastly, the Birth Certificate does not clearly state Live Child or Dead Child, and this opens the door for a presumption of death. Just like the family member who took ownership of the Crusaders estate, the trustee can claim that the grantor died or was lost at sea, so can the government. As long as you do not show up to say otherwise, this presumption becomes a ‘cured fact’ under Equity Law, and the government can step in and begin using your estate for their own purposes. Hopefully an underlying theme should be apparent, that complete knowledge or lack there of, is the root cause and therefore solution. Let’s address each of the key factors. Our Incompetence: Since it is true that when we are born we are not competent, we must educate ourselves. Knowledge is power. How can we possibly hope to get our entrusted estate back if we don’t even know it exists or that we have claim to it? The information presented in this article is a great start. But memorizing a few facts, and filling out a UCC form is not enough, this knowledge is the first layer of the onion, we need to go all the way to the core. Our Estate is not a birth certificate, or a piece of land somewhere, our estate is our mind, body and soul. This is where the lawful/legal side merges with the spiritual side. We must learn discernment, and stop placing blind faith in leaders and experts, because these are representatives, they represent us when we must present ourselves. This is done by gaining personal knowledge so we can see deception when it crosses our path, and call it for what it is. In this case, that our would-be masters, those who claim to be ‘consorts to god’ are actually in Breach of Trust with the covenant of god, because they hide the truth instead of sharing it; Dark Occultism. When we understand enough about these realities and present this truth to others we are proving our competence. Breach of Trust: The trustee’s to our estate, must be notified as to their breach of trust. Now that we have done the work to gain complete knowledge, we must begin acting on this knowledge. If we continue to accept the illusory authority of government, we are still incompetent. For example, by voting for a president, you are entering into an agreement with the government which presumes your incompetence, and their status as authority over you. By our very action of voting, we give them our consent and validate our incompetence. In this sense, knowledge will become power, if acted upon. Either we stop consenting to all the forms of authoritarian rule (paying taxes, tickets and fines, accepting corporate justice from courts, etc) and in doing so prove our competence, or we do nothing and continue to issue implied consent. In this case, there is no grey area, there are no bystanders, either you’re working to be a part of freedom or you’re working with the cabal by remaining ignorant and inactive; harsh as that may sound. Implied Consent from all other ‘citizens of government’: This last point is what unifies all the people of the world under a common cause; true freedom. Even if we do the work of educating ourselves, and then prove our competence by acting within this knowledge in our personal lives, there is still a whole world of incompetent and willing slaves to deal with. Because they have, by their ignorance and inaction, given a mandate to governments to continue slavery and tyranny, we cannot be islands of freedom within a sea of piracy. Remember, their mandate is maintained by deception and ignorance – they deceive people into giving them the ‘right to rule.’ As such our efforts MUST be focused on the unawakened and ignorant masses. When enough people have dispelled their own incompetence, by gaining complete knowledge of the problem, then we can act as a collective to dispel the presumed mandate of authority. Each person who is asleep is working for the cabal and doesn’t know it. It is our job, as those who have learned the truth, to reveal it to them, and allow them to become present, so they no longer need to be represented by government. The core problem is within each human being on earth, including the cabal themselves. The Cabal know the truth, and deceive us into accepting and maintaining our incompetence (ignorance). Humanity at large has been trained to be a slave race and accept authority as real, instead of illusory. The false belief in authority must be dispelled, by gaining knowledge of the truth, that there are no real authorities, only trustee’s given the power to manage our affairs, by our consent. As such, any solution which does not address this, is only a stopgap measure. Even if every single Cabal member was magically transported off earth, the real problem would still be here, and another master would come in to rule the well trained incompetent slaves. As such, where we focus our time and energy is crucial. We must seek to gain mastery of ourselves, and in doing so reclaim our estate; our minds, bodies and souls. As we gain knowledge and develop mastery we become deception proof and present our competence. Now we can look back in our lives and see how our actions helped maintain the status quo of false authority and tyranny and begin un-consenting by changing ourselves. Learning about health, law, and how to be honorable will help us dispel false beliefs, and empower us with real knowledge to act competently, removing any need for a ‘consort of god’ to manage our lives for us. The good news is that the whole system is designed for this purpose in the first place. Our would-be masters knew that they couldn’t stay in power unless we remain ignorant and inactive. Like a magician their illusion only works if we can’t see behind the stage. The control systems many have come to loathe (Legal codes, Equity Law, etc) are all based on trust agreements, and as soon as we become aware of this, we can take action, and the whole system of control works against the cabal and for us. Now we use the UCC and Equity Law systems to our advantage, making them honorable. In this sense, these systems are a tool, like a hammer, and are not evil in and of themselves. Simply put, the whole problem, in its full scope and impact, involves all intelligent life on earth, as each being is contributing to the current condition. We must reclaim our true estate, our minds, bodies and souls and in doing so become the free and empowered beings we were always meant to be. Now our estate is used by us create harmony and the long sought golden age on earth, instead of the horrific NWO we seem to be headed for now. Note about BRICS: There are many claims as to reforms that will change the system of control and slavery on earth, BRICS is one of them. While it is entirely possible some measure of relief maybe gained, given the realities described above, it is only a stopgap measure. We can be hopeful of a solution, but should not stop addressing the root problem.